If you don't want to read the review (I know, too many words) you can just lean back and enjoy my video report which gives you a detailed inside of what it's like to travel on Qantas 747 Economy Class. It was a very early Thursday morning in Melbourne, my bag was packed and I was waiting for my taxi to take me to the airport. The city was still sleeping and the roads were empty. Ahead of me were 20 hours of travelling. My connecting flight to Sydney was already half an hour late due to some heavy fog. After hundreds of flights I still get nervous about these kinds of things. Once I landed in Sydney I rushed to get to the International terminal, which you travel to by a connecting shuttle bus. But don't be worried, QFA63 to Johannesburg usually departs 20-30mins behind schedule every day. Even though the flight is scheduled at 9.55 am we once again left a little bit late. "QFA63 from Sydney to Johannesburg is Qantas' only flight to Africa"
Checking in was very quick and the staff were very friendly, considering it was 6 in the morning. If you only have a one-way ticket you might get some trouble. They will allow you on board eventually but you will need to prove sufficient funds for a return ticket, according to South African Immigration laws. It always depends on the person checking you in but sometimes they might ask you for a return ticket and they will not issue your boarding pass unless you can present one. Be prepared for that. The baggage allowance is 23 kg, more than enough I would say. Good service, easy done. 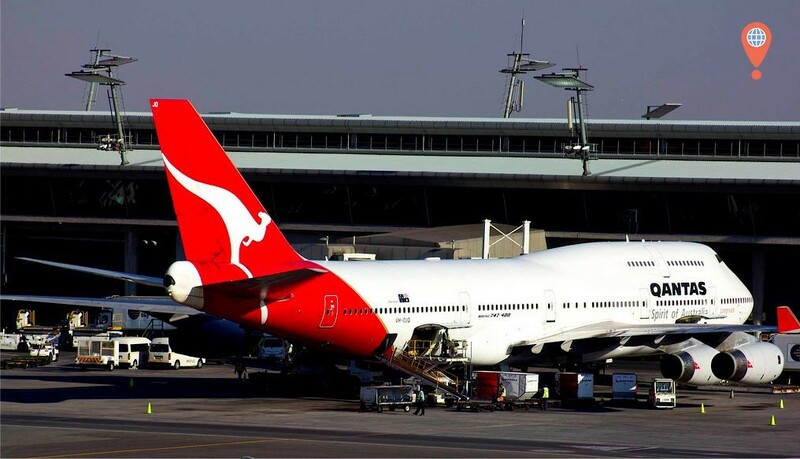 "Qantas is the oldest continuously operating airline in the world flying since November 1920"
Even though the Airbus A380 is taking over the Qantas "longreach" fleet, for me personally, the Boeing 747 remains the Queen of the skies. Parts of the 747 fleet have been operating for almost 24 years now but despite all these years and flights the Jumbo still shines bright like a diamond. Anyways, I don't wanna bring your hopes up but unlike some flights to America, Qantas only operates the 747 on this route. The chances of flying in an A380 or A330 are zero. 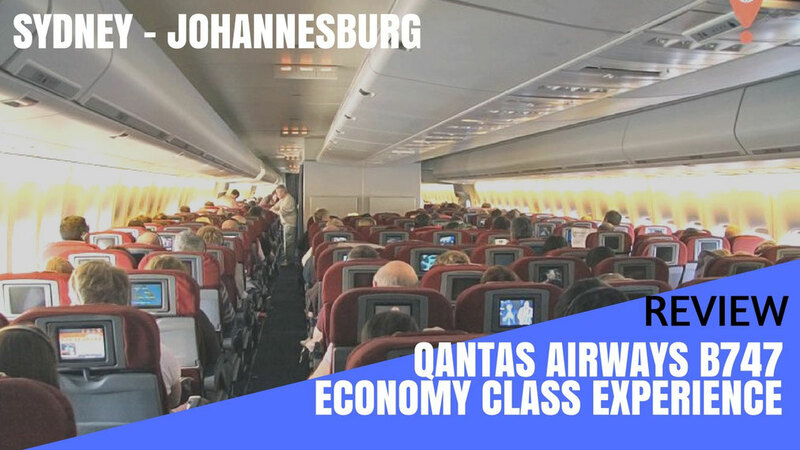 Qantas recently updated a few of their Boeings and the most noticeable change is the lack of first class on the Johannesburg flight. Yeah you heard right, the entire first class was sacrificed for a bigger and updated Business Class. More space for your legs and a better in-flight entertainment system. "Qantas is a short version of -Queensland and Northern Territory aerial services-"
You will find 58 Business Class seats on the upper and lower deck and 36 Premium Economy and 270 economy seats on this flight. You won't find any first class on the refurbished 747's any longer. The Qantas Business Class experience was definitely upgraded, you can almost say that First Class and Business Class were merged to form an improved experience. The product is impressive, with wider video screens and increased leg room. Well done Qantas, smart move. Although, the real star on Qantas flight QF63 is the brand new "Premium" Economy class. It is an affordable and clever way to travel and a great concept for the future. The snack bar and seat comfort was really outstanding. 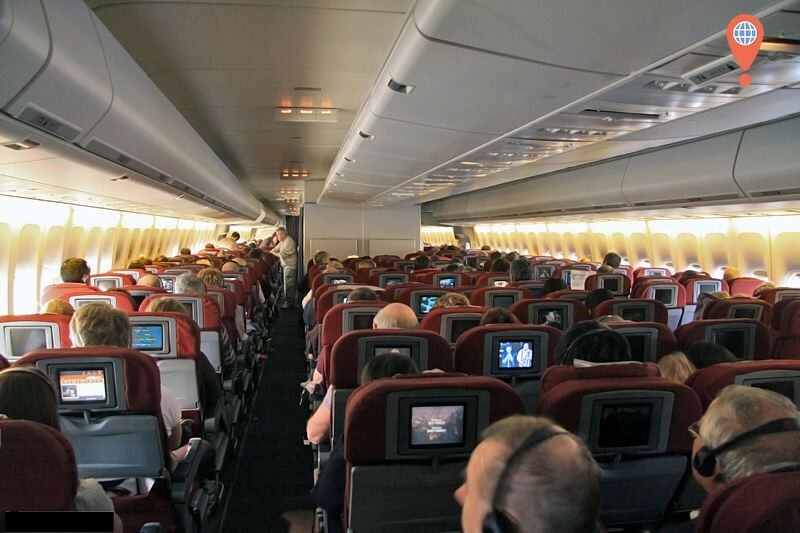 Also, its service was very close to the privilege you typically only get to enjoy on a business class flight. "The Jumbo jet flies one of the most southern routes in the world, touching the Antarctic rim"
Whilst taxiing, the flight purser made an announcement that sleeping on the floor was prohibited during the period of the flight. Along with many amongst the cabin I had a little laugh but after five hours of sitting that's just what you want to do. That's when the aircraft's 24 years of operation takes its toll. The seats are old, the screens are very tiny and most of the buttons on the remote don't function well or not at all. The range of movies is not enough for a 4 star airline and the service sometimes reminds you of an Air Asia flight. Some of the cabin crew, please more dedication! Especially on a 13 hour flight, good service is the key and a smile from time to time can change so much. I really enjoyed the food though, shortly after take off lunch was ready and snacks were served throughout the duration of the flight. Two hours prior to landing dinner was also on its way. It's not an A380 and I don't expect things to be brand new but there is some room for improvement in terms of service indeed. "To date, Qantas is still operating 8 Jumbo Jets"
Qantas' South African flight is a well-known highlight for every planespotter in Melbourne, because that's where the route takes you. After leaving Sydney airport the Jumbo aims straight for Melbourne or sometimes Hobart in Tasmania. 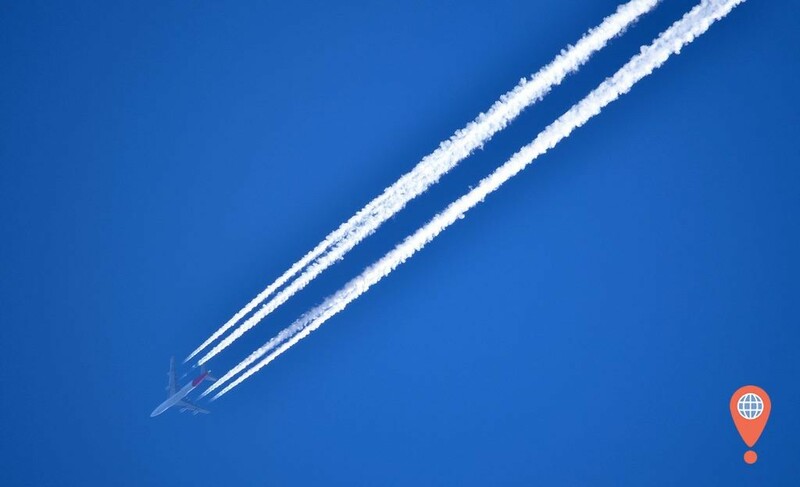 The contrails of the 747 are well known over Melbourne skies and it is the only flight that flies over Victoria's capital at this altitude. After leaving Australia the Boeing heads for one of the most southern routes in the world. 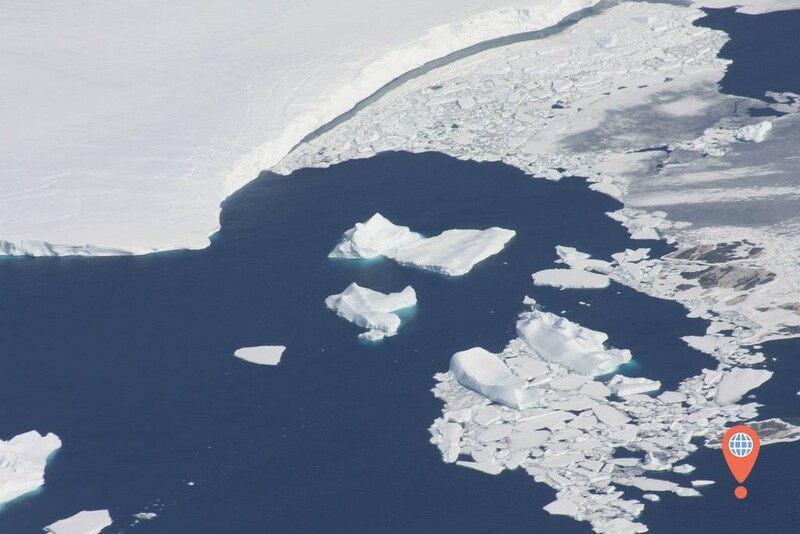 You will get to see some of the offshoots of the Antarctic continental ice sheet. If you are lucky you might even spot a polar bear (Update 2016: I know there are no polar bears)! It is truly a magnificent view and I enjoyed this rare encounter with the seventh continent. After the majority of the flight takes you over the Southern Ocean you will enter the South African airspace near Durban, From here it is just a short time remaining before landing at Johannesburg O.R. Tambo Airport. Welcome to South Africa! If you want to live track the flight you can do so on flightradar 24 and search for QFA63. The airport is located 20 km outside the city and it is Africa's busiest airport, handling 28 million passengers each year. It is named after South Africa's former ANC leader Oliver Tambo. Situated almost 5,500 feet above average sea level, the air is really thin. This means that some aircraft have to reduce their weight by loading less fuel than they would otherwise. You need a lot of patience to clear Customs though, it usually will take you around 45mins if you are lucky. But after passing the gates you will be pleasantly surprised as the airport appears really welcoming. You will see a lot of happy African faces offering you any kind of help you may need. "Johannesburg International Airport is the busiest airport in Africa"
The fastest and cheapest way is the "Gautrain" taking you right into Sandton in less than 20 mins for 125Rand. From there you can easily change to the Pretoria service. If you are planning to take a taxi you will be looking at 280Rand, which is about 29 Australian dollars. Make sure you only take an accredited taxi. Many car rentals are also available at the airport. 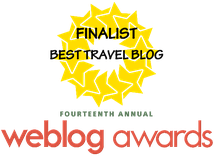 If you are just having a stop-over and you are looking for a nice place to stay close to the airport I can highly recommend the Flamingo's Nest It is located 10 minutes from O.R. Tambo just next to a little lake. For $45 you get a fully serviced room with bathroom, with Wi-fi and breakfast included. Well, considering the alternatives (none), it is by far the best flight from Sydney to Johannesburg... No but to be serious, it is probably one of the most unique flights in the world, full of charm and adventure. It's not just a trip that takes you from A to B, no it's so much more than that. Qantas will take you deep into a part of the world not many humans have ever been before. For a moment you experience the edge of the planet, a place so far from our daily world, literally a privileged club reserved for the famous explorers of past centuries. Qantas Flight QFA63 will be always remembered as one of my special trips and I can highly recommend it. The service and food were great, the seats a bit old but the overall experience was really good.